Heavy snowfall which caused traffic chaos and closed down schools across the country led to record online readership figures for one regional newspaper. Daily and weekly papers alike took to social networking sites and updated their own websites with a stream of information on traffic, event cancellations, school closures and the latest weather forecast, as well as gathering pictures taken of people enjoying the snow. The South Wales Argus celebrated its biggest ever day online, with more than 100,000 visitors checking the site by mid-afternoon on Friday – over six times its normal daily readership of 16,000 hits. Around 18,000 of them occurred between 7am and 8am alone as worried parents checked to see whether their child’s school was open for business. The comprehensive coverage even got a thanks from Monmouthshire County Council via Twitter for keeping people in the region updated. Editor Kevin Ward said it had been the best daily audience ever. “Our patch was pretty much at the centre of the Met Office’s rare red weather warning and we had nine inches of snow in some parts of Gwent,” he said. “That led to hundreds of schools being closed, hundreds of homes without power and rush-hour chaos of many roads, including the M4. “We began live online coverage at 6am in the morning, but did a lot of promotional work about our planned coverage both online and on social media the previous night. “That meant readers, local councils, schools, bus companies etc knew that by adding the hashtag #gwentsnow to their tweets they would be added automatically to our live blog on the website. We also had a special section on school closures. 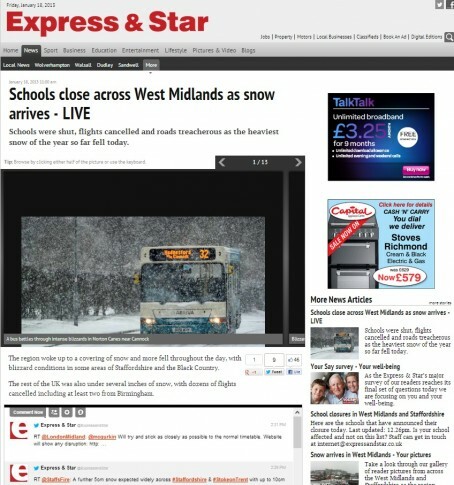 The Midland News Association, which runs West Midlands daily papers the Express & Star and Shropshire Star, also got in on the act, running live blogs attached to their respective Twitter feeds, gathering all information from the relevant travel and local authorities in one place. Staff headed into the office from 5am and print times were brought forward to produce all editions as normal – six for the Express & Star and three for the Shropshire Star. Minute-by-minute updates were posted online by social media editor Mike Woods and internet editor Todd Nash. By 11am web traffic to the MNA was up by nearly 50 per cent on the previous Friday. By that time, the school closures page for Expressandstar.com had been viewed 13,500 times, while the Shropshire page had 6,500 views. MNA spokesman Chris Leggett said: “It was a genuine team effort across the MNA to ensure that the newspapers and websites provided the in-depth coverage which our readers expect. “The weather may have posed difficulties but we remain committed to publishing the most up to date information, whether that is in the newspapers or on our websites. 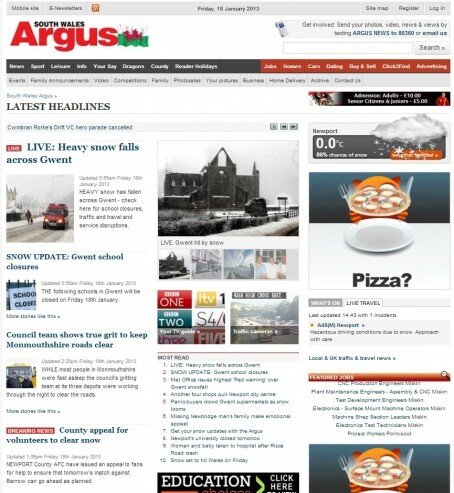 Similar live blogs were set up by papers across the country, including the Stroud News & Journal, the Worcester News and the Argus in Brighton, updating readers with the latest on the weather, travel disruption, and fun pictures posted on Twitter. The Daily Post in North Wales also carried a live blog, but with an additional dedicated picture gallery set up online and constantly updated throughout the day with pictures sent in. Will there be a follow-up story reporting the effect of the weather on sales of the printed papers?